Mail Call: Dino Drac January '15 Funpack is here! I know it sounds cliche and all, but time really does fly. Feels like yesterday the Dinosaur Dracula December 2014 Funpack was on my doorstep. And today, the January 2015 Funpack is here! A vintage Micro Machines car in custom Dino Drac packaging! Dino Drac's January 2015 Mini-Poster, and a BONUS Ecto Cooler Mini-Poster! A vintage WWF collector pin! A super stretchy King Kong keychain! A packet of especially tasty Kool-Aid...and yes it's still fresh! Drink up! The usual handful of cards and stuff! A "Beastly Myths" book -- I love this one! Dino Drac's January 2015 Specimen -- A piece of super rare TMNT cereal! But that's not all, this time around! He's also included a PHYSICAL CHALLENGE! Go to your nearest dollar store. Make the best meal you can with five bucks. I use the term "meal" loosely. If you want a bunch of Ramen and three packages of Not Quite Twizzlers, go for it. Head home, assemble your weird and delicious food on a TV tray, or something approximating one. When the food is done and the movie gets boring, flip over this sheet of paper and doodle two superhero cats battling a giant evil robot. My favorite items in this pack are definitely the King Kong keychain (say that three times fast) and the Ecto Cooler Mini-Poster. 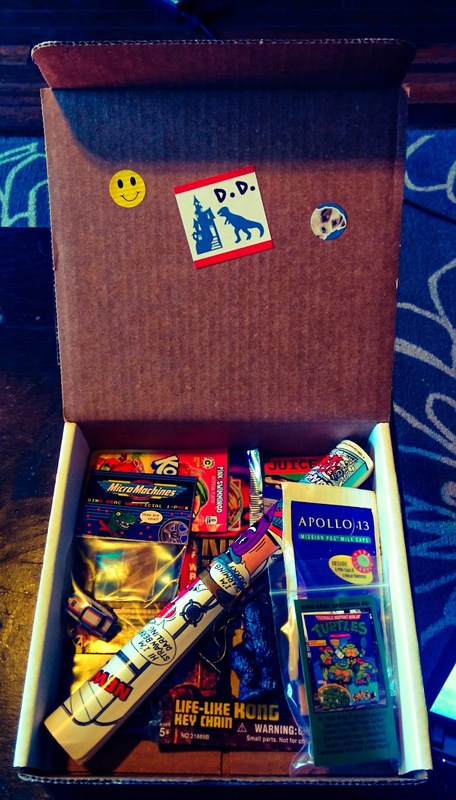 Once again, a huge thank you to Matt at Dinosaur Dracula for providing and supplying yet another awesome Funpack! Also, one of days I'll actually quit being lazy and snap some photos of the awesome goodness that Matt puts in these things.